In December 2015, 195 members of the United Nations Framework Convention on Climate Change agreed to “limit the temperature increase to 1.5 °C above preindustrial levels” in the Paris Agreement. 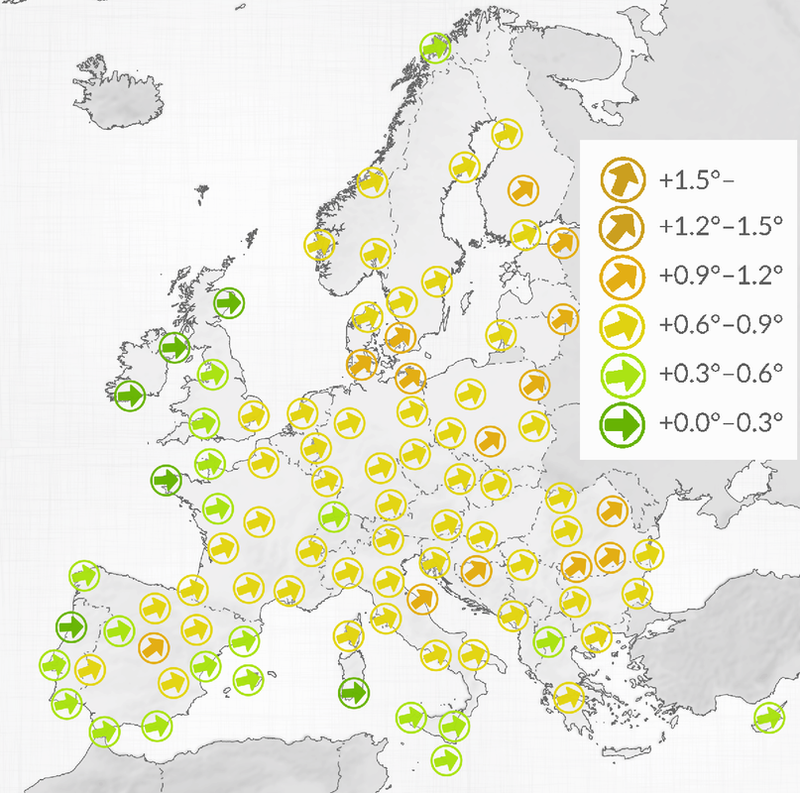 For several cities in Europe, home to millions, the 1.5°C threshold has already been reached. An exclusive investigation by the European Data Journalism Network (EDJNet) shows that in the Nordic and Baltic regions, in much of Andalusia and in South-Eastern Romania, average temperatures in the 21st century were already much warmer, sometimes by several degrees, than in the 20th century, already affecting the life expectancy of Europeans, their health and well-being.The 1.5°C temperature increase is a global target and areas that are warming faster are not off-track from this goal; scientists have expected for decades that polar regions would warm more than areas closer to the equator. The arrows show how much the temperature increased since last century, in selected cities, in six steps; from a very small increase (green, horizontal arrow), to a very large increase (red, almost vertical arrow). Not all cities in the analysis are displayed. Despite the higher temperatures have had on European cities, it is hard to see concerted, concrete adaptation efforts being carried out locally. Some national climate change plans conflate the fight against climate change with adaptation to higher temperatures. Climate change can only be contained by keeping hydrocarbons in the ground and capturing carbon from the atmosphere (neither option has produced any result so far), whereas adaptation to higher temperatures means ensuring that human settlements remain livable under a changing climate. National plans are often limited to regulatory instruments, such as incitative taxation for renewable energy. When it comes to creating green spaces to limit the heat island effect and, therefore, mortality from heat waves, to upgrading the local transport network to make it more resilient to heat or to installing cooling devices in classrooms, cities are on their own. In the coming weeks EDJNet will publish a series of stories on the local impact of the rising in temperatures in specific European cities, and investigate if and what kinds of measures local authorities and other stakeholders are preparing to mitigate the adverse effects of increasing temperatures. Browse the cities reports. Analysis and reporting was done by the European Data Journalism Network (EDJNet). Partners include OBC Transeuropa (Italy), VoxEurop (France), Alternatives Economiques (France), Spiegel Online (Germany), EUobserver (Belgium), LocalFocus (Netherlands), Pod črto (Slovenia), BiQdata (Poland), J++ (Sweden), Askanews (Italy), Internazionale (Italy), NRC Handelsblad (Netherlands), El Confidential (Spain), H-Alter (Croatia), Ouest-France (France), MobileReporter (Italy), Newsworthy (Sweden), Público (Portugal), and Capital (Bulgaria).